We are looking at one of the few Field Spells on the Forbidden and Limited List for Throwback Thursday this week, Divine Wind of Mist Valley. 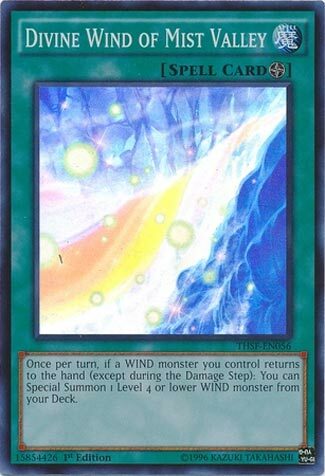 Once per turn, if a Wind monster returns to your hand, you can summon a Level 4 or lower Wind from the deck. Self bouncing has been abusable for years now, and this card helps promote those degenerate self-bouncing combos. I don’t know of the exact combo that got this card limited, but just by looking at the effect, this card deserves the limit. Harpie Dancer helps you get Channeler from the deck with this card, and the obvious Mist Valley synergy is obvious, especially with Genex Ally Birdman in Wind decks. The card is good for Wind decks, if it has self bouncing in it, I say play the 1 copy you are allowed. The only Wind self bouncing deck I probably wouldn’t use this card with is Yosenju, but it is worth considering for that deck as well.